Although she is far from a household name in the Hampton Roads area, the upcoming performance by Chicago based vocalist Spider Saloff promises to be a special evening for jazz vocal music aficionados. 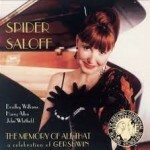 Saloff has been a fixture on the vibrant Chicago jazz vocal scene for me many years. She has recorded about a half dozen albums over the last 20 years. Her latest was a musically adventurous collection entitled “Like Glass”. It was released in 2005 and was featured heavily on “The Vocal Sound of Jazz”. In presenting her Gershwin program at The Ferguson she will be drawing from her 1997 release “The Memory of All That”, which was an all Gershwin musical celebration.